Back cver blurb: SOMEONE TOOK DAISY MASON... SOMEONE YOU KNOW. The RICHARD AND JUDY BOOK CLUB pick everyone is raving about, this pulse-pounding thriller about the search for a missing child is perfect for fans of THE COUPLE NEXT DOOR. 'One of the best crime thrillers I have ever read' Kathryn Croft HOW CAN A CHILD GO MISSING WITHOUT A TRACE? Last night, eight-year-old Daisy Mason disappeared from a family party. No one in the quiet suburban street saw anything - or at least that's what they're saying. DI Adam Fawley is trying to keep an open mind. But he knows the nine times out of ten, it's someone the victim knew. That means someone is lying... And that Daisy's time is running out. Close To Home was a novel that continually surprised me. Just when I thought I knew exactly what was coming next, a surprise twist was thrown in taking the novel in a new direction. The first novel of a new series featuring DI Adam Farley, I look forward to reading more from this author. When Eight year old Daisy Mason goes missing from a family BBQ, DI Adam Farley is one of the first on the scene. His suspicions are immediately drawn to the family, in cases like these someone close to home usually knows something however much they profess not to. Naturally the police are keen to find out who the last person to see Daisy was, and the last known time she was seen. Easy enough you would think, as Daisy was dressed in fancy dress, as a Daisy! However it seems that eight year old girls are fans of dressing up and that Daisy wasn’t in a Daisy costume after all, and no one seems to know what she was wearing that evening having swapped costumes with a friend but not telling anyone. Was Daisy even at the party? Did she come home from school that day? What secret was she keeping from her best friends? These are all questions that DI Farley needs answering, and fast, if Daisy is to be found alive. Close to home I think is the only novel I’ve ever read that doesn’t have specific chapters and I did find this a little odd to begin with, but once I’d gotten used to it I realised it’s purpose. Sometimes harrowing details are interspersed with Social media content and police interviews, I don’t think this novel would have worked any other way. 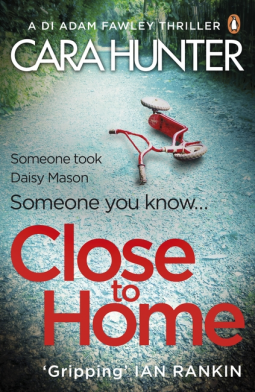 Close To Home is available now via Amazon online and all good books shops.